“Corporate cash holdings currently equate to 150 per cent of annual profits, while most firms use hurdle rates of more than 10 per cent, which exceed the cost of capital and are rarely updated,” he says. 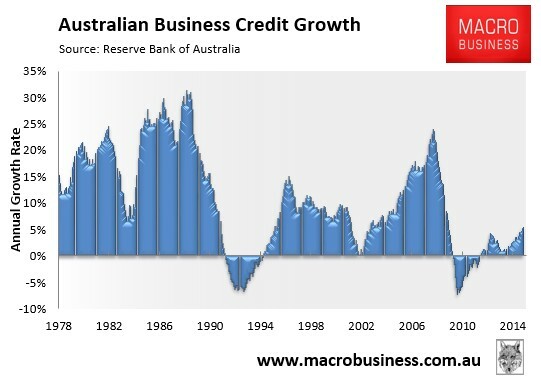 Certainly, a glance at the RBA’s credit aggregates data supports Davies’ contention, and shows business credit growth tracking at a low level, despite historically low nominal interest rates (see next chart). 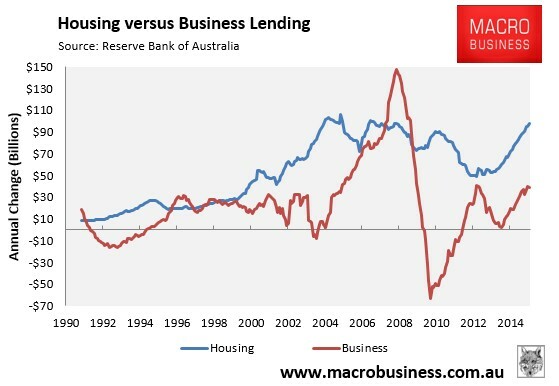 The contrast between business and housing lending is also stark, with housing lending approaching a record high in nominal dollar terms, whereas business lending is tracking at levels just above the mid-to-late 1990s (see next chart). 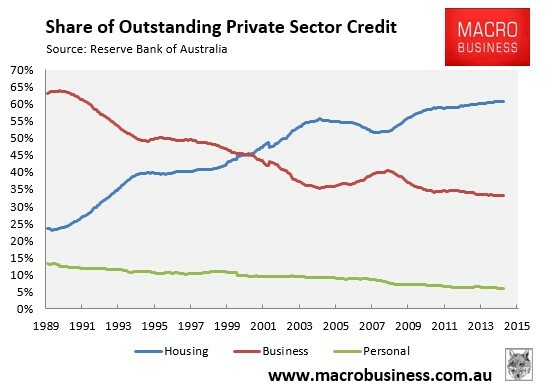 The share of loans going to business is also tracking near all-time lows, whereas housing is at record highs (see next chart). All in all, this shows that the decline in interest rates has so far done little to stimulate the productive economy, and has instead been funneled into non-productive houses. This highlights the need for strong macro-prudential curbs on mortgage lending, so that lower interest rates can assist in lowering the dollar (thereby helping business to become more competitive), without inflating housing even more.